We have worked with Kankakee Community College (KCC) for many years and they have utilized nearly every one of our services. 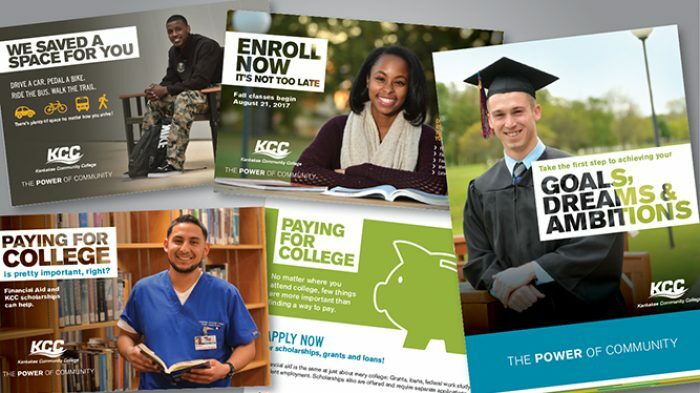 Our most comprehensive project was overhauling KCC’s brand identity, standards and messaging including new collateral packages, integrated marketing materials and logo. KCC also utilizes our custom marketing automation platform, Revir, to manage internal and external marketing and communication plans. By using Revir, KCC can upload, modify, approve and execute mailings, emails, social media posts and more for targeted audience segments directly through their custom-built online portal, saving key staff time end energy by streamlining the marketing process. It’s all a perfect example of our mission to be the place where strategy and implementation meet. We don’t simply provide KCC with new ideas, we help tangibly execute strategy.